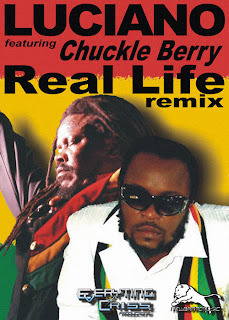 iDancehallReggae.com::Caribbean Lifestyle Media::: Chuckle Berry Tells Luciano This is "Real Life"
Chuckle Berry Tells Luciano This is "Real Life"
Canadian based Dancehall artist Chuckle Berry is currently riding a wave of success with his latest single titled Real Life on the New Brand Music Imprint. The single which also features veteran reggae singer Luciano was produced by DJ Chris and Anthony Malvo on the Pick Up the Pieces rhythm. “My new song with Luciano is doing very well right now; it’s getting a lot of love from disc jocks all over the world, especially in Canada and Europe.”Since its release a few weeks ago the single has been getting heavy rotation in Canada, Jamaica, the US and Europe. Real Life is currently number4 in Italy on DJ Gusma T’s Top 20 Reggae Singles Chart. The gravelly voice deejay has been working hard to establish himself on the Canadian music scene since moving there in 2010. So far he has been able to make serious inroads in Canada with of hits songs such as Bumpa which was recorded on Delly Ranx’ Saudi Arabia Rhtyhm, Dirty Talk and Life. Chuckle Berry says since making the move he has been able to build on the success he has experienced in the past with songs such as Good Life and Johny B Good which appeared on Sly & Robbie’s 2011 Grammy nominated compilation album titled One Pop. “Since I moved to Canada I have been doing a lot of work, all over the world people know me because of Good Life. I have been working hard to build on that by continuously releasing more good songs and its paying off, my fan base has increased significantly in the last 12 months. I have been doing a lot of shows and requests are coming from promoters all over the world,” said the artist. Chuckle Berry is currently working towards the completion of his debut album which is slated to be released later this year. He is also preparing for an upcoming tour of Europe.